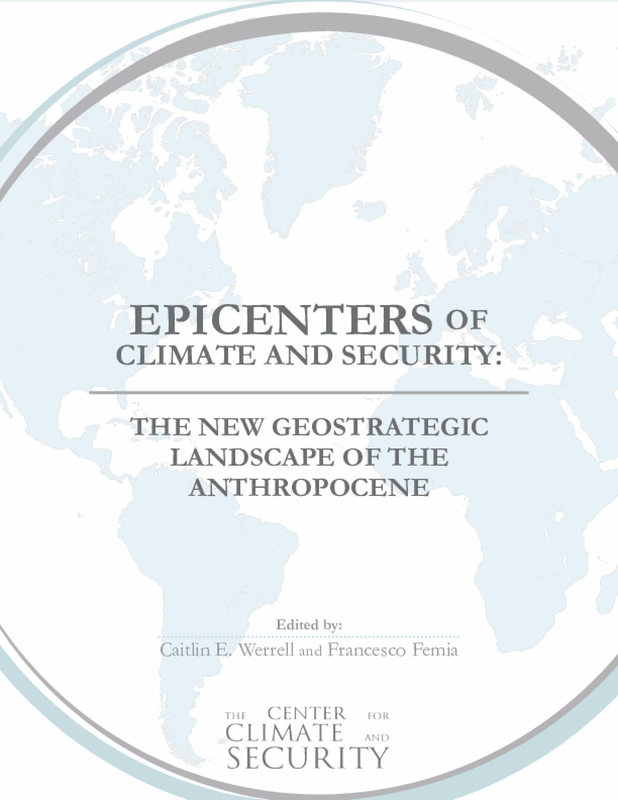 "Epicenters of Climate and Security: The New Geostrategic Landscape of the Anthropocene" is a multi-author, edited volume exploring a range of "epicenters" of climate and security and how they shape the geostrategic map of the 21st century. These epicenters are defined as "categories of systemic risk" driven by a changing climate interacting with other socio-political-economic dynamics. A systemic risk is a risk to a component or components of a system that, due to the critical nature of the components, can significantly disrupt (and sometimes collapse) the whole system that depends on it. In this report, an "epicenter" is defined as a category of systemic risk, or simply a collection of systemic risks with similar characteristics – a kind of "super-systemic risk." For example, the Strait of Malacca is a major maritime trade route connecting the Indian and Pacific Oceans that is critical for global trade and security. Risks to freedom of navigation through the Strait of Malacca, or broader risks to the stability of the Strait, can therefore be described as a systemic risk to global trade and global security. However, there is more than one critical maritime trade route in the world. The Strait of Hormuz, the Panama Canal, the Arctic Northwest Passage are just a few of these critical nodes in the global trade system. Many of these straits will face disruptions as a result of a changing climate. Together, these straits present a category of systemic risks to global trade and security, and are therefore considered an "epicenter" of climate and security. This volume explores many such epicenters. Copyright 2017 by The Center for Climate and Security. All rights reserved.